*ahem* So. As you know, the other day someone posted a garden-variety antisemitic and misogynist rant on a YouTube video of mine (the one of me teaching a Mishna, which they only could have found through this page). Not that I hadn’t seen this kind of sludge before, but it was the first time I had comments like that directed at me. I took screenshots of it (without the user name of the perpetrator) and posted it on LtJ’s Facebook page with a mocking comment of my own. My post with one of these lovely comments. Some people suggested that I shouldn’t be giving the perpetrator a platform by perpetuating his message of hate and sharing it. I decided to write this post as a result. I’m a self-defense instructor. Responding to violence is one of my areas of expertise. Hate speech is a form of violence, and I responded the way I would have taught my students to respond. Given the general post-Brexit-post-USA-elections atmosphere these days, knowing what to do when you’re targeted by hate speech is sadly more relevant than ever. Please note that I am going to use the feminine to refer to the person who is defending herself and the masculine to refer to the perpetrator for convenience only. Both could be of any gender. The first thing I teach a self-defense student to do when she finds herself in an uncomfortable situation is to ask herself: What is happening to me right now? How do I feel about what’s going on? Sometimes, she may not be sure. I teach women to listen to their bodies: is your heart beating fast? Are your breaths quick and shallow? Are your palms sweaty? Are you shaking? These are all signs that your body is responding to a perceived threat. In the case of our Internet troll, I didn’t feel threatened. It was just an anonymous comment on the Internet. Research shows that Internet trolls are literally losers. The comments did contain threats of violence, but how seriously am I going to take that when the dude is using the easiest, most cowardly form of verbal abuse to try and hurt me? What I felt was angry. And exasperated. 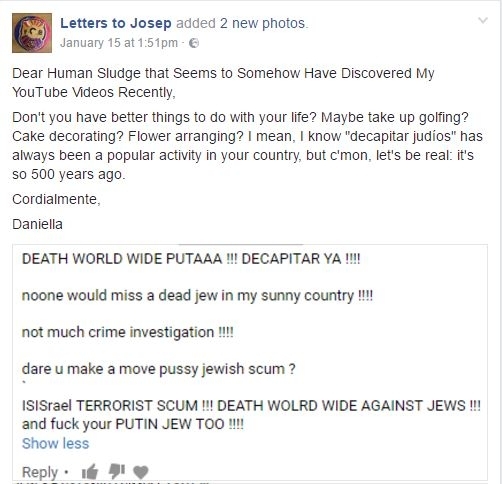 What kind of a loser has enough time on his hands to seek out videos made by Jewish women and write out long antisemitic rants? Don’t people have better things to do with their time? The next question to ask is, What do I want to happen right now? What do I need to feel safe? Some possible examples: I want this person to go away. I want him to stop touching me. I want to disappear. I want to get out of here. I want a friend to hug me and tell me everything’s going to be okay. I want to kick this guy’s @$$. The next question is, What can I do to help myself feel safe? There are a number of options. In the type of self-defense I teach–known as empowerment self-defense–we believe that the goal of a self-defense course is to expand our students’ options, giving them greater freedom to choose how to respond. This can be a good option if you think that engaging with the perpetrator may escalate or perpetuate the situation, and you aren’t concerned that ignoring him will make it worse. Sometimes ignoring it takes the wind out of their sails and will make the abuse stop. As kids, we are told to do this with bullies. It can work sometimes, but not always. You have the right to remove yourself from any situation that makes you uncomfortable without any excuse or explanation. This is usually the safest option, too. The problem is, sometimes you can’t get away, or turning your back may be dangerous. In those situations, it’s best to choose a different response. It’s up to you. Sometimes starting a friendly conversation with a person hurling hate speech at you can be productive and change their views. Sometimes not. You should only try to do this if you feel up to it. You don’t have a responsibility to educate this person on human decency. Your first responsibility is to yourself. In self-defense, we teach women how to set firm boundaries using strong, confident voices, direct eye contact, and assertive body language. You have every right to look at this person straight in the eye and say: “Do not speak to me like that. Leave me alone.” You don’t owe this person an explanation of what he is doing wrong or why you want him to stop. Just tell him what you want him to do, and repeat it over and over if you have to. In self-defense, we find in many cases that setting a firm verbal boundary can put an end to the vast majority of situations of threat. This is because bullies and abusers pick on easy victims, people who will not stand up for themselves or fight back. If you show a willingness to stand up for yourself, chances are, the perpetrator will back down. We teach physical techniques in self-defense classes, but only as a last resort: when you feel threatened with physical violence and you see no other safe way out of the situation. Obviously, this isn’t something I can teach you in a blog post! Which is why everyone should go take a local self-defense class. 😉 Knowing some physical techniques boosts your confidence and makes you feel safer. Non-lethal weapons such as pepper spray can help, but they have some downsides too: what if they malfunction, or you can’t grab them when you need them? Your body is something that will always be at your disposal, and there are easy, strong techniques that you can learn to use effectively in just a few classes. Though I did not feel threatened by my Internet troll, it does put an amused smirk on my face to know that even if he did have the guts to physically threaten me in person, he might find himself on the business end of this knee. If you’re in a public place and someone is speaking abusively to you, the people around you might not respond at all. This is not necessarily because they don’t want to; it may be that they’re afraid, or that they’re stuck in Bystander Syndrome–a phenomenon where witnesses of an attack do nothing to stop it because they think someone else will do something. Simple: address one person directly, and even better–give them a concrete instruction. “Excuse me sir. Can you tell this man not to speak to me this way?” “Excuse me ma’am. Will you call the police, please?” Even just saying, “I need your help,” addressing one person directly, can jerk them out of denial. After the situation has passed, it’s important to recognize that being threatened–no matter how the situation ended–can be traumatic. You deserve support, and you don’t have to be alone with it. Tell someone you trust who will support you and believe your story without judgment. We strongly encourage students to file a report if they have been attacked or harassed. Whether you choose to do this can depend on a lot of factors, but we encourage it because it can help you feel empowered, that you have done something, and it can help keep other people safe if the perpetrator is caught and dealt with appropriately. What I wanted was support. I reported the comments to YouTube, removed them, and blocked the user from commenting on my channel. Then I shared my story, because I didn’t want to be alone with it. And, of course, I wanted to use that most Jewish of coping mechanisms–dark humor–to distance myself from the abuse and help myself feel more empowered. I know that as an author who is growing her platform, and especially as a Jewish woman and an Israeli, this is not going to be the last time I’m going to get comments like this. Sometimes I may choose to ignore it and shut it down so the abuser doesn’t get the satisfaction of seeing the effects of their words. Whatever it is–it’s up to me. He threw his words at me; they’re mine now, and I’ll do whatever I like with them!